The husband and I will be attending a wedding this weekend. The young couple is mid to late 20’s. We’ve known the groom since his first year of college. They both have their professional careers well under way and are now ready to build the personal part of their lives. The event is to be held at the Biltmore in Phoenix. I’ve personally never been there but I envision it as being pretty fluffy. They’ve built a website to keep family and friends up to date of all the wedding goings on. I’m pretty old school but am computer literate and depend on it for a lot of stuff, so this seemed pretty cool to me. Invitees were to RSVP through the website. If you were traveling from out of town it informed you that a block of Biltmore rooms were set aside at a discount rate. The photo album contained hundreds of engagement pictures. There is a Wedding Party page… that’s blank. Seems to me that page would be used to introduce or thank the wedding party for being part of their BIG day. And then there’s the Gift Registry page. The concept of a gift registry has been around for a long time and I kept checking that page so I could go SHOPPING. Finally a month or so before the wedding they posted something on the Gift Registry page. It made me gasp! They didn’t do a Gift Registry anywhere! They were requesting GIFT CARDS! There was a list of 6 places, some physical building others online shopping websites. I have already admitted that I’m old school, BUT… GIFT CARDS… REALLY? Being old school I NEVER buy gift cards for anyone, for any occasion. I know it’s work for them but it takes some of the FUN out it for the rest of us. I was disappointed. 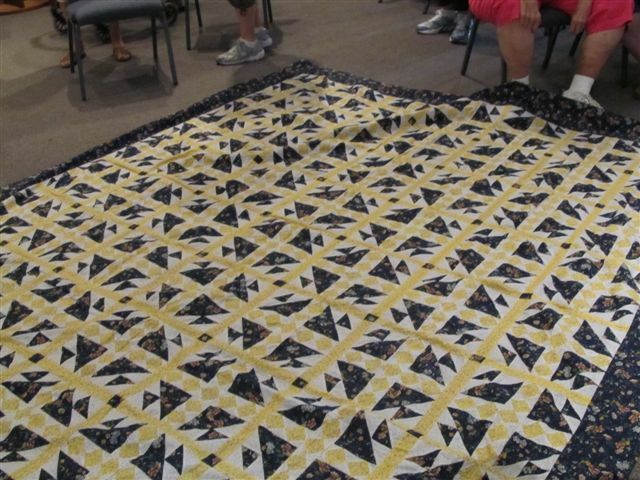 So, I decided to do what old school people like me do… I made them a quilt! 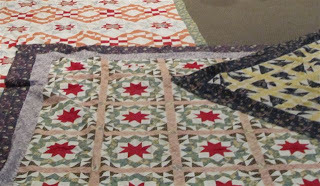 I was looking for an excuse to try my hand at making a MODERN style quilt AND use up some of my stash so I was able to talk myself into it rather easily. The pattern I used came from the Fall 2011 magazine “scrap quilts” by Fon’s and Porter but used less modern colors. 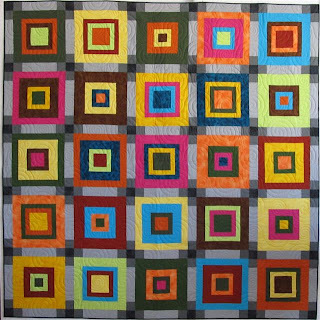 The pattern resulted in a much larger rectangle quilt and was suppose to have circles fused on the blocks with the larger size centers. The finished size of this quilt is 72” square, I thought square was more appropriate for the overall modern feel I was going for. And I really didn’t want to mess with the fusing stuff so I left off the circles. Of course, the project took longer than I had anticipated. I really like the finished result but if I had it to do over I would probably just give them a GIFT CARD. As I walk away from this project I’m taking with me the consideration to join the new millennium and give more gift cards. Yesterday my day was spent with NATURE, in the form of ANTS. There were hundreds, if not thousands of the little tenacious crawlers invading my house! This wild adventure actually started the night before as I crawled into bed I noticed an innocent little ant between the sheets. Silly me… I thought it got there as a stow away on the cord of my heating pad (is that too much info?) A nearby window had been open during the day and I rationalized its presence by thinking it had wandered through the window and found its way onto the cord that I then put on the bed. I mean really, how else could it have gotten there? The next morning I wandered down the hall towards the coffee and almost reached my destination before I realized my walk, almost the entire length of the house, had been in a trail of ants! The trail started in the dining room at the cat’s food bowl and it led the colony down the hall to an area rug. I get the invasion of the food bowl but don’t get the area rug. ??? So in an attempt to GET RID of them I started with some wet paper towels. Paper towels… not much of a weapon. But my thought was, “I’ll just wipe them up.” Yeah, not so much, there were WAY too many for that tactic. My next logical thought was, “I need to do a MASS killing!” Under the kitchen sink there was a bottle of Lysol Disinfectant Spray (now that’s a WOMANS tool). It worked wonders as I sprayed it on the trail of invaders. Then those wet paper towels came in handy for the removal of all those little DEAD ants. It sounds like everything is under control, RIGHT? But the more I got rid of the more I found! They were not only in the dining room and down the hall; they were also in the KITCHEN and TWO bedrooms and BOTH bathrooms. 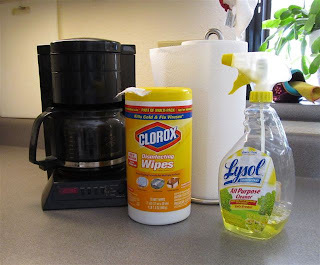 I did switch my paper towels in for Lysol Disinfecting Wipes (I use these things for EVERYTHING). My thought was the disinfectant (what ever that STUFF is) would kill the pheromones they were leaving behind and they would think the trail was NOT in my house making them go back to where ever they came from. I learned that without a trail they just run around EVERYWHERE looking for it! So now most of these guys (or gals) were not as organized as the first invaders cuz they didn’t have the TRAIL thing going on. Which meant the remainder of my day was spent killing them ONE ant at a time. ALL DAY long I was KILLING ANTS! Every time I entered a room I saw little ants running around aimlessly! At 10:30 last night I was still killing ANTS (in the bathroom)! 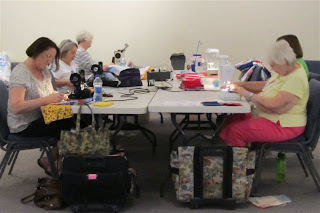 Sew… Yesterday was the Peace by Piece Quilters monthly bee and it was a FUN and BUSY day. There were 29 of us filling Mission Hall of the church. 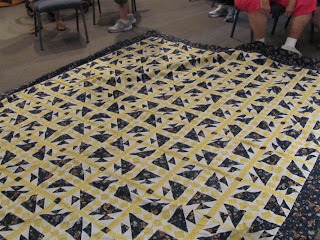 At the end of the day we had 39 finished quilts ready to go out into the community for children needing a HUG. Mission Hall is a large enough space that we can spread out to nurture the creative process. 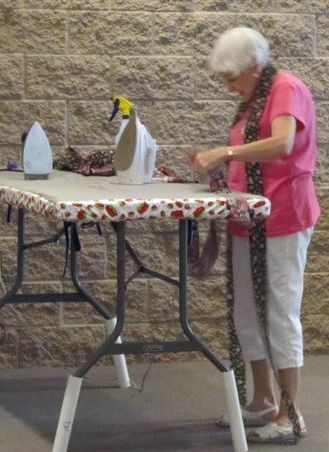 Making a quilt includes a little pressing and to get the job done we have two ironing stations with two irons on each station. Those stations rarely spend a minute without use. Making so many quilts requires a LOT of batting. This is our batting station which is usually busy all day. It takes two volunteers to cut all that batting for the quilts ready to be quilted. We had a surprise visitor to the bee this month, Pat. All of our scrap fabrics are passed along to Pat and she uses them to make beds for dogs and cats that are currently living in shelter. Pat did a little BED Show ‘n Tell for us and shared her bed-making process. Every Year Mission del Sol church starts the New Year out holding fundraisers to raise money for their missions. As a Thank You for allowing us to use their space for our bees we provide them with a quilt they can use as a fundraiser by selling raffle tickets. This year we had three vintage quilt tops (aren't they AWESOME!) donated to us that are too large for children. So we are going to finish one of them and give it to the church for their mission fundraising effort. 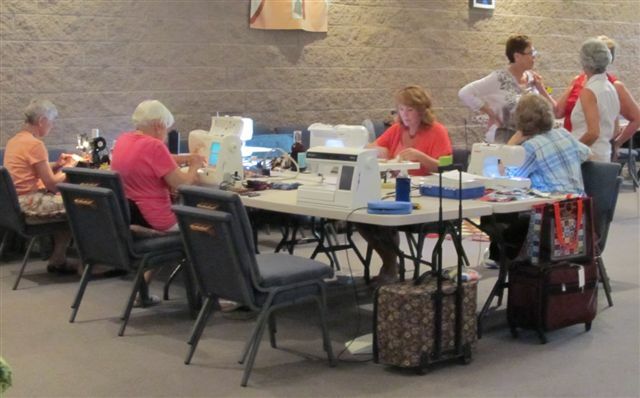 So we took time away from our sewing machines to inspect each one and make a decision on which one we would complete to donate to the church. This is the one the ladies decided on. 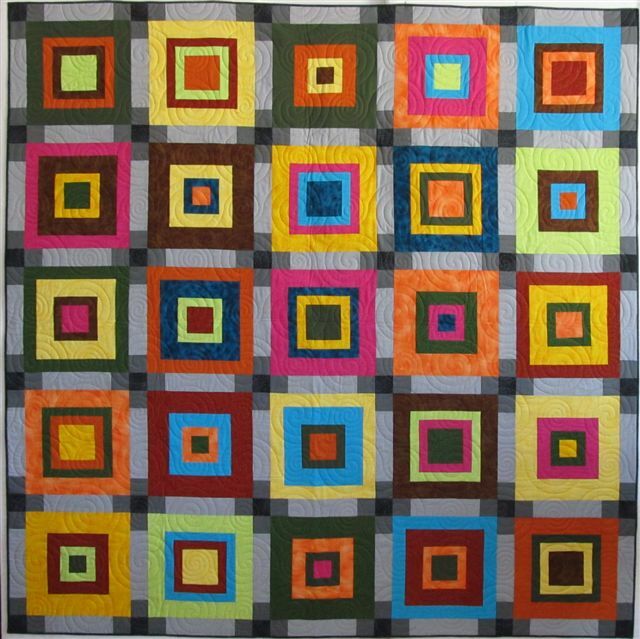 I’ll be purchasing backing fabric in the near future so we can move forward with completing the quilt. 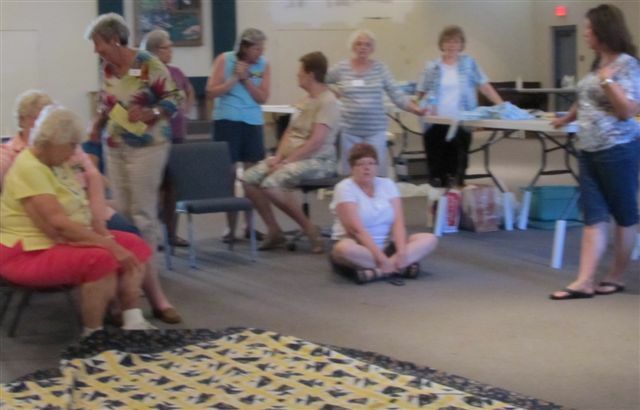 If you would like to learn more information about this group go to www.peacebypiecequilters.org. Our next bee will be on October 4th. We would love to have you join us. Today I’m getting all the last minute STUFF ready for tomorrow’s charity sewing bee. This bee happens once a month at a nearby church with ALL of the quilts going to seriously ill and traumatized children in the Phoenix area. 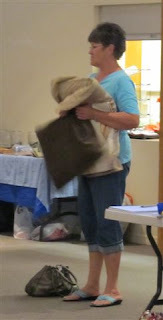 All of our quilts are distributed by AZ Blankets 4 Kids www.azblankets4kids.com. We do it all at the bees… sort fabric, cut it into kits, sew tops together, quilt, and bind. The finishing touch is to sew the labels on. 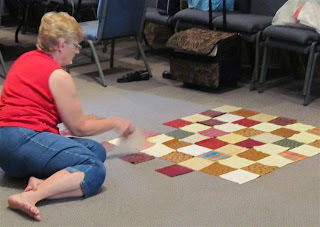 Near the end of the day there is always a SHOW ‘N TELL of all the cute quilts we’ve completed that day, usually around 40. 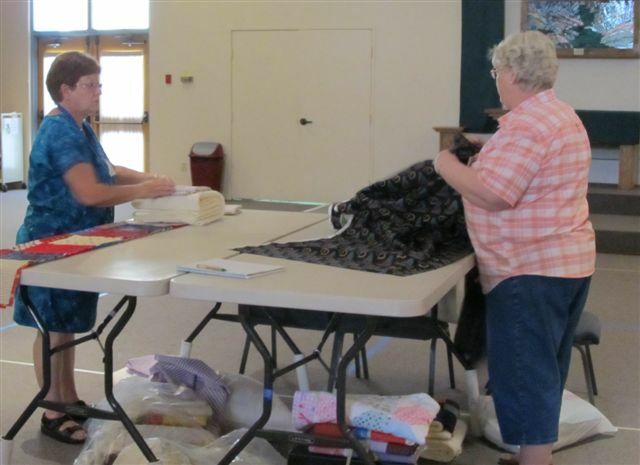 If you would like to learn more about our charity bees go to www.peacebypiecequilters.org. Better yet, go to the website for directions on how to get to the bee and COME JOIN IN THE FUN! 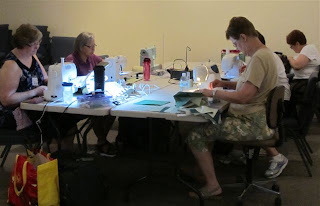 We have a VERY LARGE room to sew in so there is always room for one more. It really is a FUN way to spend the day and you go home with a WARM HEART. Another project has made it to the DONE pile! This one wasn’t a UFO very long but I was determined to have it done by the Holidays. 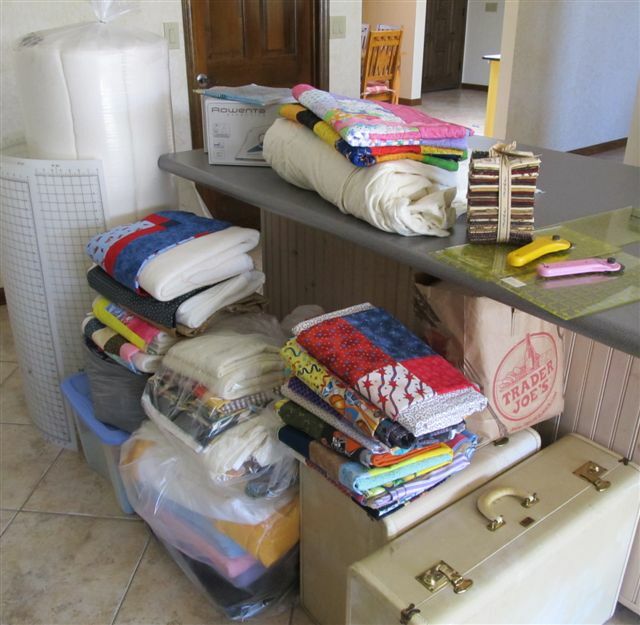 The July 26 post ‘This Problem I Got…’ shared with you a less than desirable piecing result. The whole thing had a slight “S” curve to it that was made very evident by those yellow squares that ran down the center. I spent a considerable amount of time trying to get rid of that “S” and although it is less noticeable than it was, it’s STILL THERE. This piece ALMOST ended up in the trash! 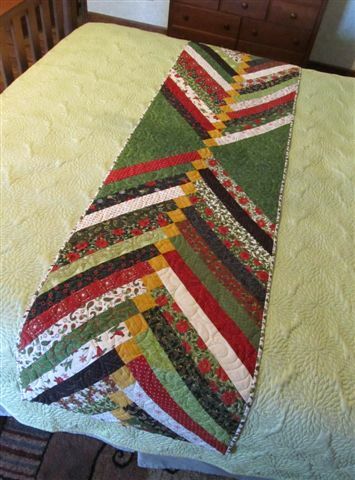 I convinced myself to spend a few hours quilting it to get a true visual on how BAD it was. The only thing that saved it from going in the trash was that it wasn’t being made for someone else. It was only going to live on my bed for maybe a month outta the year. So here it is, DONE! That “S” will probably SCREAM at me every time I walk in the room and see it. If it drives me too crazy it may end up in the trash after all.